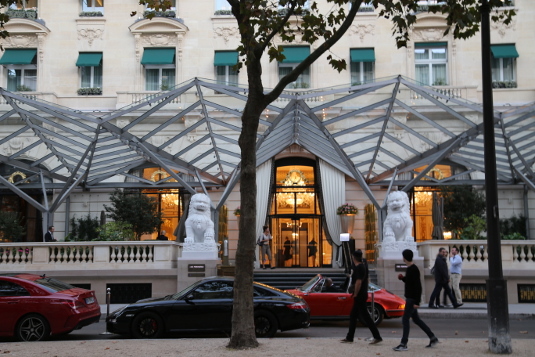 One of two impressive entrances at the Peninsula Paris. This historic room at the Peninsula Paris was the backdrop for the end of the Vietnam War. 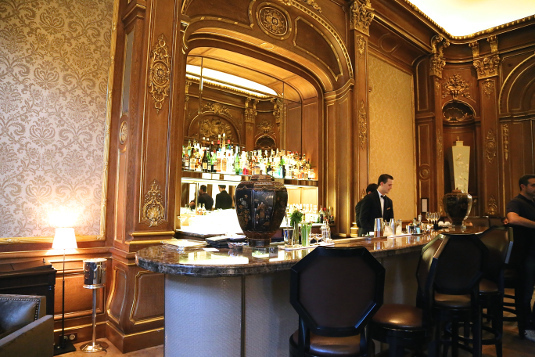 It has been reimagined as one of the city’s most beautiful bars. 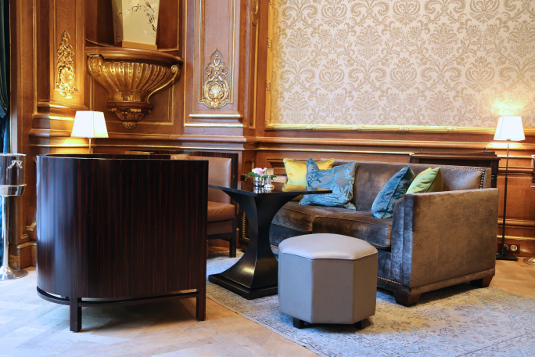 The new Peninsula Paris hotel is located in a stunning Haussmannian building near the Arc de Triomphe with a very storied history. It opened as the Hotel Majestic in 1908, became a hospital during WWI, and hosted lavish parties attended by the likes of Pablo Picasso during the 1920s. George Gershwin even composed an American in Paris there in 1928. The German Military High Command took it over during WWII (a Hitler assassination attempt was reportedly planned at The Majestic by an officer who disagreed with some of his policies). After the war, it became UNESCO’s headquarters. 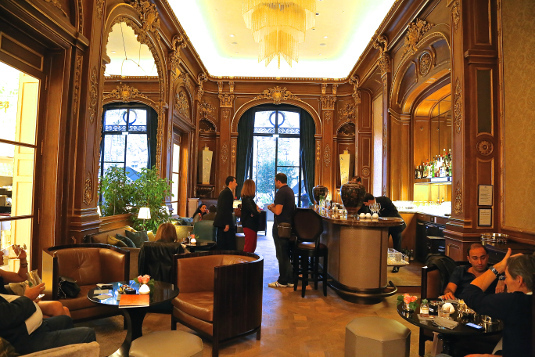 Staying at the meticulously restored hotel will cost you a pretty penny, but it’s very possible to it in without booking a stay just head to the stunning Le Bar Kléber. I stopped by Le Bar on a balmy fall afternoon. Even though I was by myself, I was seated at a table with a beautiful leather banquette near the open double height doorway. 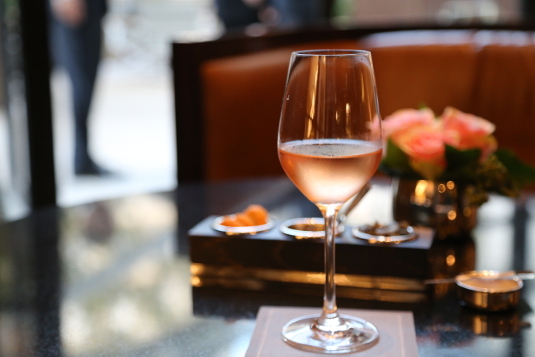 I enjoyed a glass of rosé for just seven euros with an assortment of little bar snacks and soaked in the sumptuous atmosphere. Rosé and snacks at Le Bar Kléber. The long narrow room is paneled in oak with intricate gilded molding. It’s a testament to the artisans who are still practicing their craft in France today. Atelier Fancelli, a family owned company who has been doing wood restoration for three generations, is responsible for the bar’s restored woodwork. Ateliers Gohard, another family-owned company who previously handled repairs to the domes of Les Invalides and the Palace of Versailles, did the gold leafing. The bar, like the hotel, has an intriguing history. The Paris Peace Accords, bringing the Vietnam War to an end, were signed here in 1973. Cocktails are expensive, around 20 euros a piece, but it may be a small price to pay for being swept back to the glamorous Belle Epoque for an hour or two. Seating areas feature sumptuous furnishings. For more on where to drink, eat and shop in Paris check out Part One of My Paris Guide. Part Two has all my favorite hotels, markets and day trips.